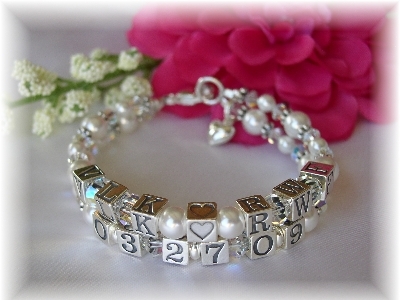 Celebrate your love�or friendship with this beautiful sterling silver and pearl bracelet!� Two strands...one for his and her,�mother and child, or BFF initials, the other to commemorate a special date such as your engagement, wedding,�anniversary,�birth date, graduation date or day you met!� Great for women or teens! This beautiful bracelet created with sterling silver and Swarovski crystal pearls is the perfect gift for the bride-to-be or new bride, new mom, or as an anniversary gift for any of the women in your life. Also a great gift for Mom or your best friend! It will be a cherished piece of jewelry!